When we were drafting themes for issues of the Journal, I settled on community for the March issue mostly because it would be election season for the Student Council. I wanted to give students the space to voice both affirmations of and frustrations with community on campus, knowing that we're stronger when we can speak truthfully to each other, with genuine concern about our life together. We need that space and the Journal seemed like the ideal place to offer it. And then, General Conference happened. The Special Called Session of the General Conference of the United Methodist Church met in St. Louis on February 23rd through 26th to discuss the UMC's stance on human sexuality, a topic that has been dividing us for years. While some hoped that this General Conference would provide unity, unity was not what happened. In the wake of General Conference, for United Methodists at least, community has taken on new meaning and new urgency. You'll see some of that in this issue. There was a beautiful moment at General Conference. You'll see it in the background of some of the pages of this issue and you can watch it here. 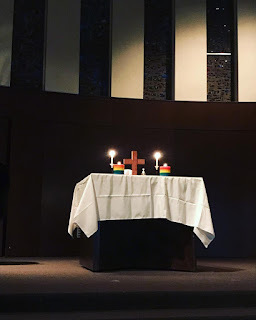 During the opening day of worship, after hours without any mention of the LGBTQIA+ community, those most impacted by the General Conference's decision, someone requested prayer, and a circle formed on the floor, holding hands and dancing with the rainbow flag while the band sang, "I need you to survive." Friends, we need one another to survive. 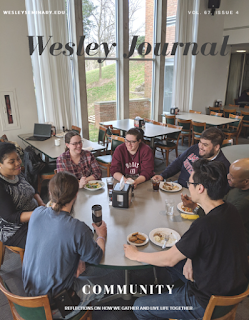 My hope is that in this issue, you'll find stories and thoughtful reflection to help guide you as you consider what community, here at Wesley and anywhere else you may go, means to you. 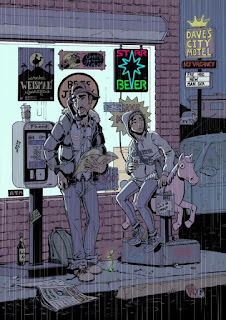 The Gift of Community by Duchanna Brown Intentional Community by Ellie Crain A Commuter's Perspective by Teer Hardy Community/Comunidad by Alfredo Santiago Mental Health in Community by Laurel Capesius and Jesse St. Clair Community in Exile by Nate Choung You can read the entire Journal in PDF form by clicking here. 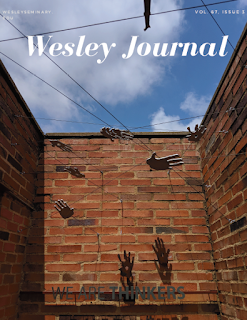 We'd also like to recommend that if you haven't already read it that you spend some time with the New York Times' piece "We Are Not Going Anywhere: Progressive Methodists Vow to Fight Ban on Gay Clergy" which features Wesley's own Chet Jechura, who has written for the Journal in the past. As we move forward, throughout this school year and throughout whatever lies ahead for the United Methodist Church and Christianity in the United States and the world, remember Paul's words of encouragement in Philippians 1:6: "I am confident of this, that the one who began a good work among you will bring it to completion by the day of Jesus Christ." Let's go do the work ahead of us, surrounded and cared for by the community we build. For some of us, the beginning of a new semester is a familiar routine. We register for the classes we want to or have to have, we struggle to remember where exactly the booklists are posted, we wait for the syllabi to be uploaded to blackboard, and then we pull out battered calendars and dig out highlighters that have been derelict for months to write down assignments and deadlines. Or, maybe we find ourselves getting that first email from that one on-top-of-things professor that begins, "In preparation for our class tonight..." and realize that we do, in fact, have class tonight. Still, regardless of how we start the semester, we make it to the end all the same. What a relief it was when I finally accepted that we do not have to go through the struggles of mental health alone. But how exhausting it was when I realized that “getting help” did not mean that resources would fall into my lap. Getting help meant doing a significant amount of research, including but certainly not limited to utilizing the resources on Wesley’s website, the Psychology Today website, and endless Google searches. Getting help meant taking risks and being vulnerable with complete strangers. How disheartening it was to put hundreds of dollars into therapists who weren’t the right fit and medications that didn’t work. It does not escape me that I had the privilege of being able to have insurance, and to afford what insurance wouldn’t cover (which is a lot).